Just because the sun's out, it doesn't mean you have to let your style slip. I feel I'm at that awkward age when it's time for me to smarten up my wardrobe without looking like a city-stiff in a boxy suit and with no style. This isn't me saying I'm usually one to wear a hoodie and sweatpants, bit I thought it was about time I took inspiration from some of the most stylish men of the 50's and found a new look for the season. The high waisted trouser automatically conjures up black and white pictures of impeccably dressed guys in the 50's in my mind. There was something about that era that had everyone looking cool, and the style has always been one that I've admired. This pair is a great lightweight cotton that make them perfect for the summer. They're a great way to look sharp, and avoid both overheating and having to wear a pair of shorts. 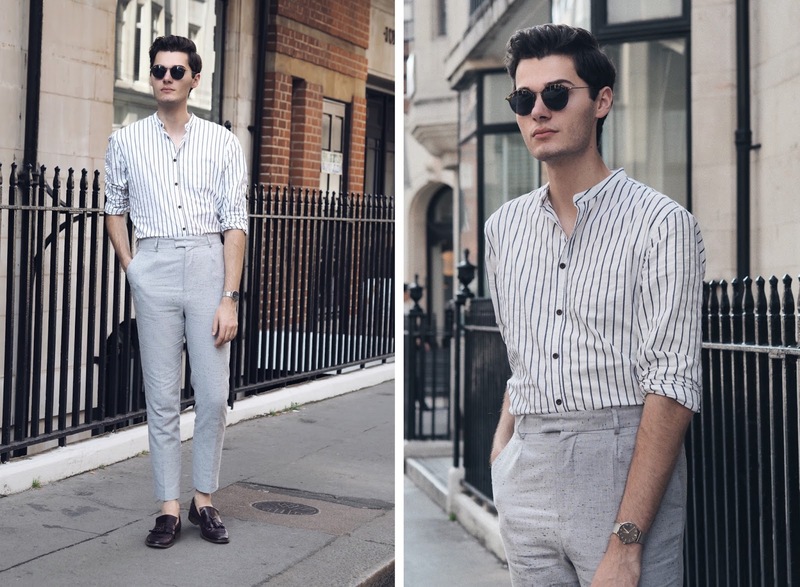 Partnered with a shirt in my favorite summer time pattern, loafers and a pair of timeless sunglasses, you're ready to go from the office to rooftop cocktails . I opted for a grandad collar shirt to dress down the look and to keep it a tad more modern.